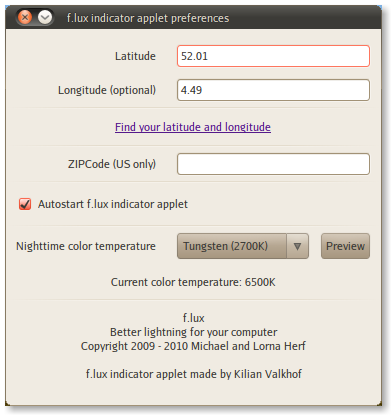 We're happy to announce a proper Linux f.lux GUI, along with a ton of bugfixes to the command-line app. PPA install instructions are on the github page. The 32-bit command-line version is available here: xflux.tgz. The indicator project (GUI) was begun by Kilian Valkhof (creator of trimage) in 2010. A group of volunteer maintainers are fixing bugs currently. f.lux maintains the command-line daemon.